Battlefield 3 was one of the games I had the pleasure of previewing at E3 this year. In fact, I got custom made dog tags as one of the developers was running through features and interesting info about the game. 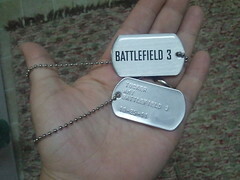 Right before we were led to the room filled with Battlefield 3 multiplayer loaded computers, we were handed out dog tags and I wore them until I got home. This new video isn’t long but it’s still badass and gives you a nice taste of what you can expect when the game finally goes gold.